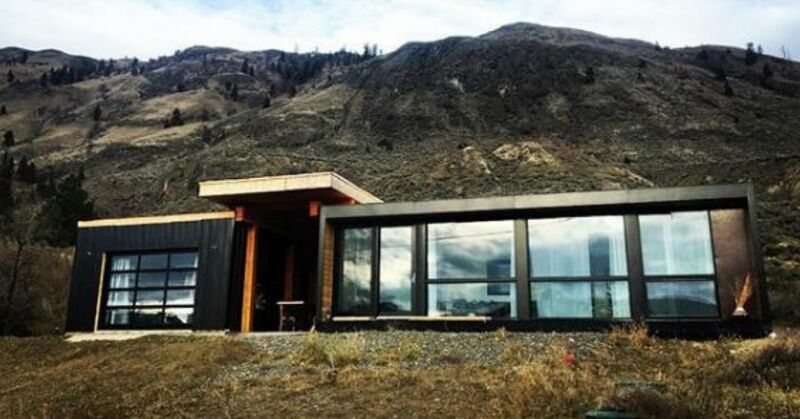 Tucked along the South Thompson River in Kamloops, British Columbia, this Black Box container home offers a truly unique experience with breathtaking vistas of a majestic mountain range. Nestled in a desert landscape, visitors are shocked to learn the home is crafted completely from shipping containers, designed to withstand the harshest of climates. The home offers floor-to-ceiling windows for unobstructed light and views, a sliding glass door entrance and a covered breezeway for al fresco entertaining. Rented as an Airbnb, this compact design offers two separate living spaces. The 710-square-foot container home sleeps four, and a 384-square-foot studio offers accommodations for two. Inside, a contemporary design aesthetic features Scandinavian furnishings that don’t overwhelm the small floor plan. Inside the larger container home, high-gloss white paint keeps the focus on the view, with floor-to-ceiling windows on the home’s south side. The kitchen features recessed LED lighting, soft-close cabinetry and quartz countertops. An 8-foot island is complete with a cooktop and microwave, and the kitchen features an apartment-sized fridge and a built-in dishwasher. Scandinavian-designed Article furnishings decorate the living room, finished with worldly touches such as a hide throw rug and a Moroccan-inspired tufted ottoman. Two compact bedrooms are called “sleeping closets,” but they don’t skimp on comfort. The master bedroom offers a queen-size bed and views of the majestic mountain range. In the guest bedroom, a double bed offers a pillow-top mattress, so the only thing that will disturb guests’ slumber is the rising sun. The neighboring studio is small but mighty, with a large garage door that opens to the acreage and South Thompson River views beyond. A kitchenette is complete with a full-sized fridge, hot plate, microwave and high-gloss kitchen table. The queen bed has a dense foam mattress for comfort, and the bathroom offers a hand-tiled walk-in shower. Throughout, personalized touches include a record player and album collection and a chic zebra-print chair.